Newly redesigned magazine utilizes mobile technology to create an interactive print experience for both readers and advertisers. By building on the print experience with an immediate, interactive and customized mobile experience, we can help advertisers get closer to our most engaged readers. Following its recent and hugely popular redesign, Reader’s Digest has chosen Gold Mobile and its high performance platform to enhance the publication’s print offerings with in-the-moment, interactive mobile experiences. The partnership, which launched in the January 2014 issue of Reader’s Digest as part of the publication’s Read Up campaign to celebrate the magazine’s refreshed, modern redesign, utilizes text messaging to provide readers with added content and advertiser information, all on their mobile phones. The interactive experiences powered by Gold Mobile will serve to enhance and expand upon the content in the print edition of the monthly magazine, providing advertisers with an express mobile channel to their consumers. Participating partners in the January issue, including Geico, Nature’s Bounty, Collette Travel, and Texas Tourism, have already received nearly 25,000 text responses to their offers. 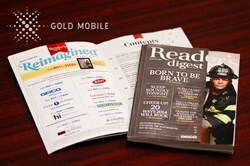 Using Gold Mobile’s platform, print readers will be able to enter sweepstakes, receive digital offers, interact directly with advertisers, and join the Reader’s Digest Mobile Club using their mobile phones. The integration of mobile promotions into the print issues of Reader’s Digest will enhance the value of the magazine to readers and advertisers alike. Readers will now get extra articles, video and audio, sweepstakes, and other calls to action, all of which is accessible from and designed for mobile devices. Advertisers can utilize these mobile promotions to provide extra information about their products, direct consumers to their website, or gain feedback. The addition of these mobile elements will also increase advertisers’ ROI by providing a way to measure just how readers are interacting with the advertisements they place in Reader’s Digest. “Incorporating an interactive, mobile experience will further enhance the inspiring and actionable content Reader’s Digest provides in its monthly magazine. This mobile-enhanced redesign will provide readers with the experience of discovering content and help to attract a younger, tech-savvy audience, while also expanding upon the methods advertisers use to interact with consumers,” said Bob Gold, CEO of Gold Mobile. As part of the Read Up campaign, Reader’s Digest has included digital advertisements on billboards at both Time Square and Grand Central with call outs to text the keyword “readup” to the number 51684, allowing readers to receive a free digital download of the revamped January 2014 issue. Gold Mobile is a leading provider of mobile enterprise solutions for the hospitality, healthcare, and consumer product markets. Gold Mobile provides a high performance enterprise-grade mobile platform supported by a suite of customizable mobile software tools, applications and world-class services for customer relationship management, marketing, rapid crisis communications and alerts, and mCommerce. For more information visit: http://gold-mobile.com. Reader's Digest simplifies and enriches consumers' lives by discovering and expertly selecting the most interesting ideas, stories, experiences and products in health, home, family, food, finance and humor. Reader's Digest is available around the world in print; online; via digital download on iPad, mobile apps, Kindle, Kindle Fire, Nook, Sony Reader and Zinio; books and home entertainment products; Facebook, Twitter and other social media outlets. For more, visit: http://www.RD.com, follow Reader's Digest on Facebook, Twitter and Instagram: @ReadersDigest and tag #ReadUp to join the conversation.